We love visiting Folly Farm Adventure Park and Zoo, so when we were asked to support Britain’s Best Days Out by visiting and reviewing one of Pembrokeshire’s favourite Family Days Out, we were delighted! The day was even more special as Jo was also chosen to be one of Folly Farm’s reviewers, so it was a real family occasion! A rainbow shined over the park, giving us the promise of a good day ahead! Folly Farm gave us free wristbands for every child just in case. During a past visit I was especially grateful for this as I lost Caitlyn! But thanks to the wristbands, the friendly staff and their Lost Child Procedure we soon found her! 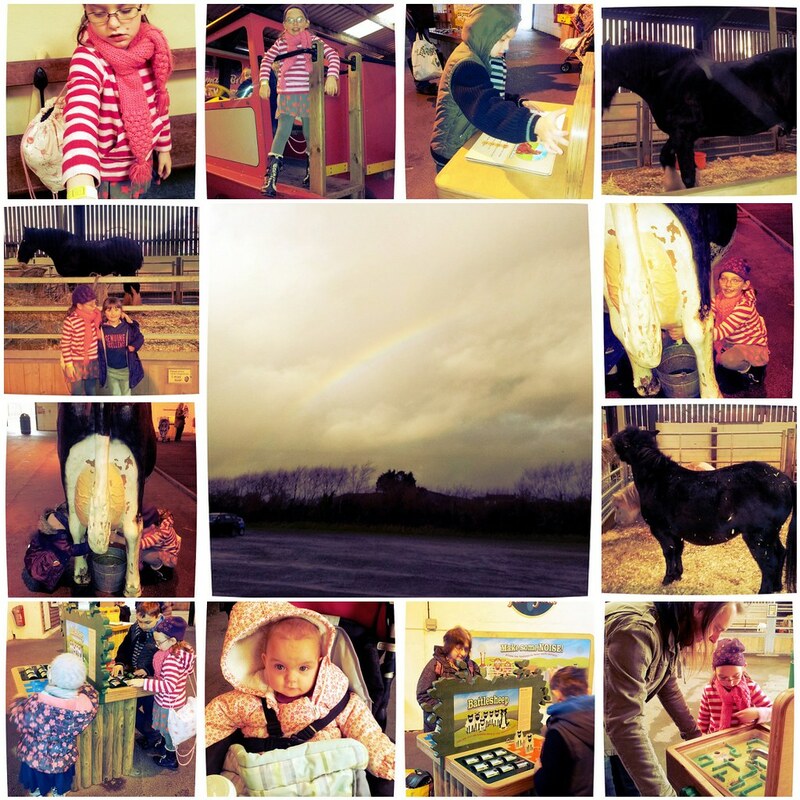 Our first stop- the Jolly Barn and Farm to visit the animals, play on the tractor and learn about farming in the Discovery Farmyard. Caitlyn loves the goats! 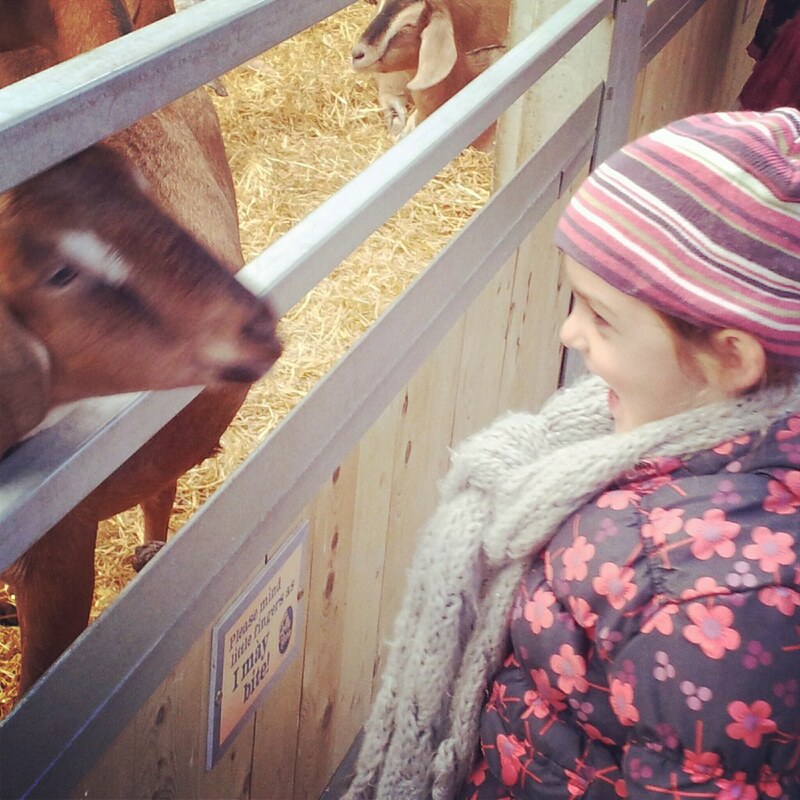 There were opportunities to meet Farmyard Friends and to Hand-Milk a goat throughout the day. I used to love bottle-feeding the goats! From the Jolly Barn you can climb aboard the Land-Train, rest your legs and explore Follywood Country Park, home to Percy’s Piggery, outdoor paddocks with rare breeds of animals, a deer enclosure and a nature trail! 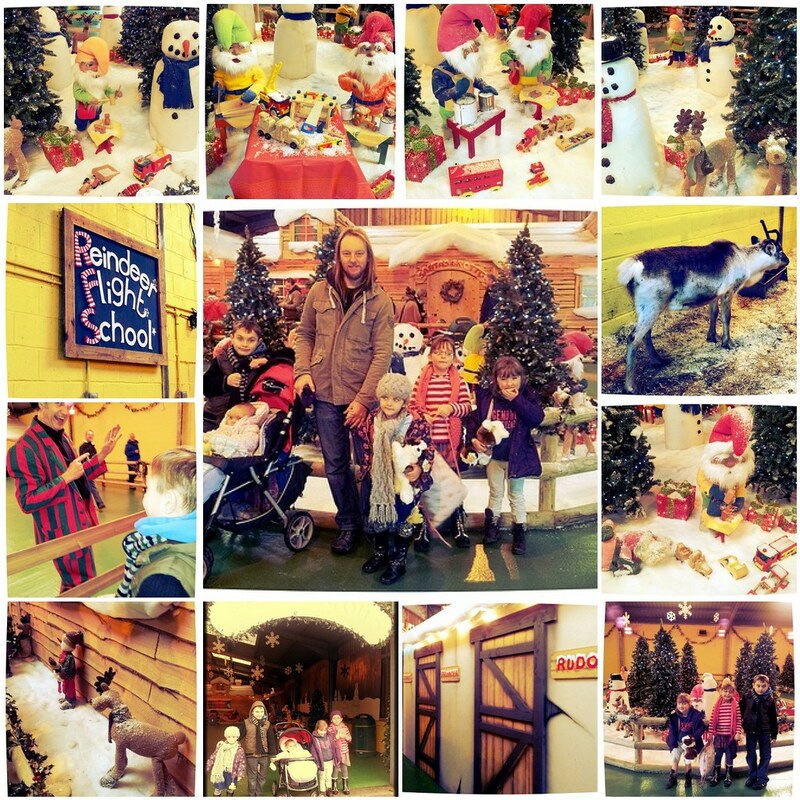 Folly Farm is so magical during the Winter Season. I highly recommend a visit to Santa’s Grotto. We arrived at the Grotto before the queues formed, but we wouldn’t have minded queuing. Why? There is so much to take in and Luke Jugglestruck keeps everyone entertained while you queue. One year, we pumped up balloons and made balloon models. This year he showed us magic tricks! Jo enjoyed her mulled wine! Cheers! Santa was lovely, Cerys and Caitlyn were a little unsure of him at first and he took his time to put them at ease. Rebecca gave Santa a picture she had drawn, they all told Santa what they would like for Christmas and we were allowed to take our own photos of the occasion. Isabelle was very happy on Santa’s lap and he joked that we could come and pick her up at the end of the day as she was so lovely. He high fived the older children, which they loved, and told them how good they were and thanked them for being good and polite. This was music to my ears! 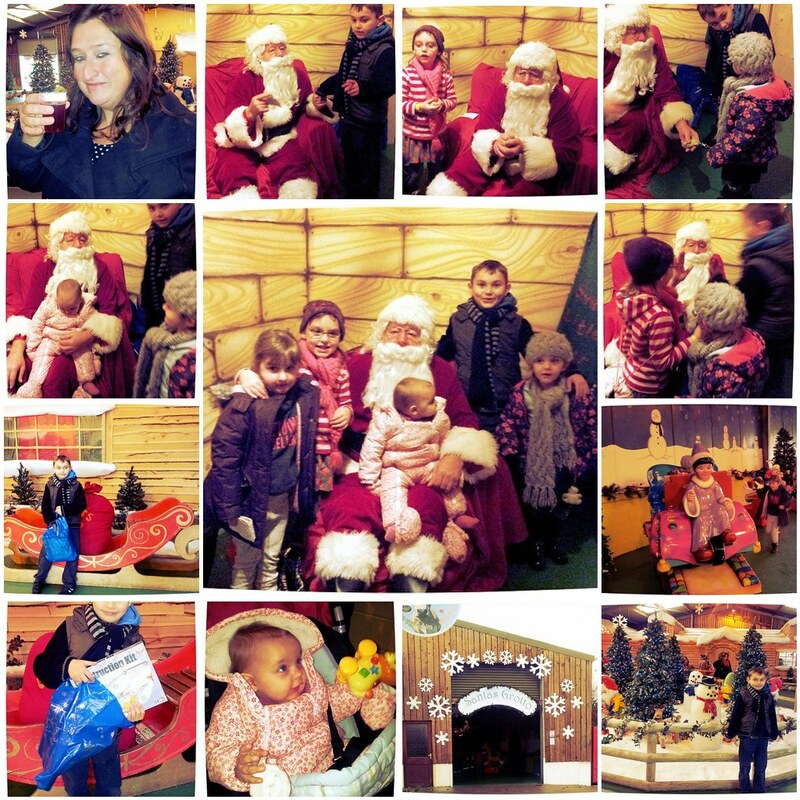 Santa’s Grotto is only open for two more weekends, if you haven’t been yet, you should get your (ice) skates on to visit it! 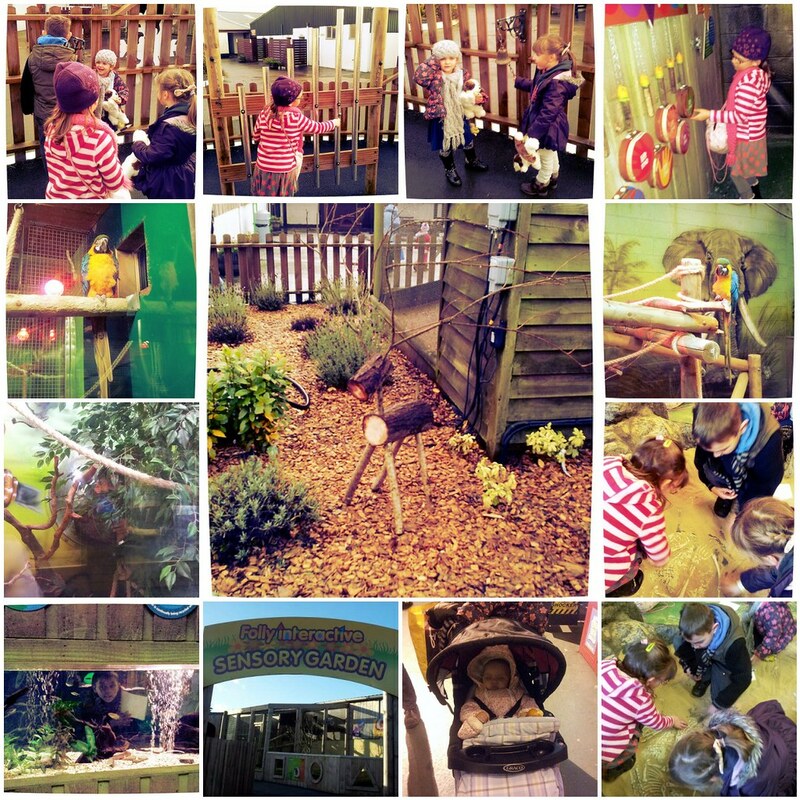 We then visited Folly Interactive and the Sensory Garden. In the Sensory Garden, I think Caitlyn’s Hearing had sensory overload while Cerys rang the bell! She had her hands over her ears! This was not the case while she was ringing it herself! There are also scented herbs to smell and bright birds and fish to see. There are opportunities to have “Close Encounters” with the animals in Folly Interactive throughout the day. The kids enjoyed seeing the fish, birds, reptiles and other animals. I was quite proud of myself when I was the first person to spot the Armadillo in the same enclosure as the Marmoset Monkeys! They also enjoyed the interactive exhibits, such as “Whose Poo?” (yes, really!) and “What’s that Whiff?”! In Folly Interactive Explorer they uncovered fossils and looked at insects through magnifying glasses. I love the Reindeer made from branches! At Follies Theatre we saw the Jugglestruck Show, the kids loved it, Isabelle kept shouting out to Luke Jugglestruck! . I loved the bubbles! Some years, it has “Snowed”! After the show, we ate our picnic in Carousel Woods. There are also outdoor picnic areas. 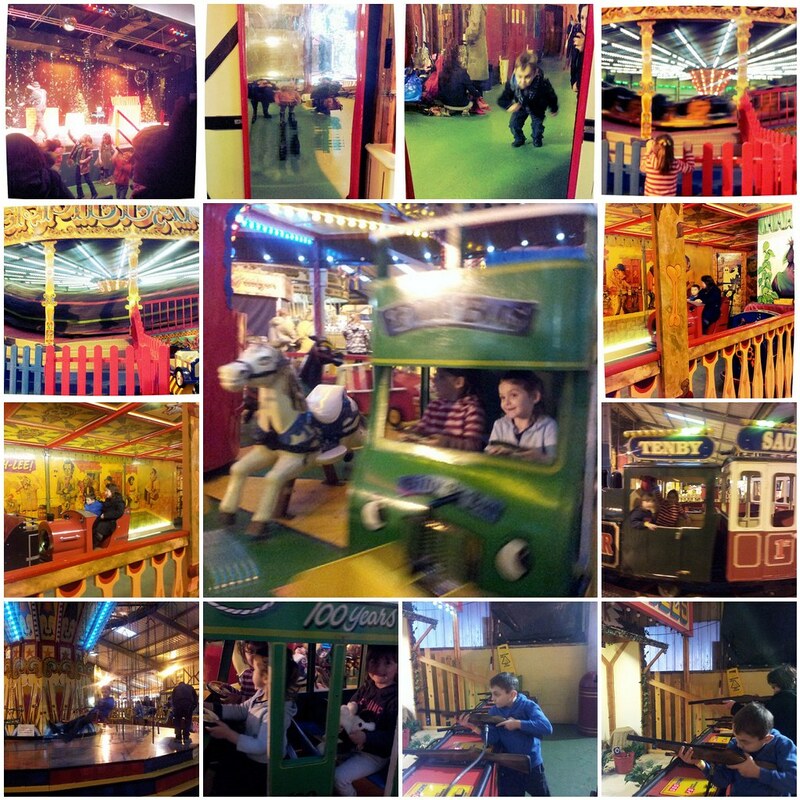 Carousel Woods is an enormous indoor play park with soft play for the younger children and a play area suitable for the older children (and even grown ups if you want to join in!). We love the big slide! After a play in the woods we went to the Vintage Funfair. It is very impressive- the largest undercover vintage funfair in Europe and you can take an online guided tour here. We love the rides: there are the usual dodgems, waltzers, swing chairs and carousels, but also more rarely seen rides, such as the Caterpillar and the Coronation Speedway. The Ghost Train was a little too scary for Caitlyn, bless her! Folly Farm is suitable for all ages, from young to old and they really make an effort to help parents with babies and toddler, with their Parent and Baby Room. I have sat in this room many a time on the comfy settees and now the comfy chairs, breastfeeding my babies. There are also nappy changing facilities and baby feeding facilities (a microwave and high chairs). There are other changing facilities around the park and lots of toilet facilities too, which is handy for just toilet trained children! 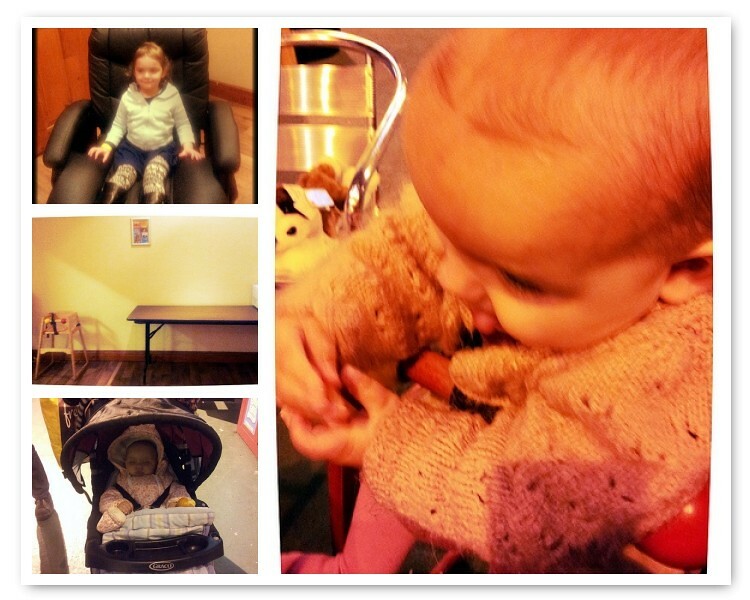 There are plenty of high chairs in all the eating areas too. If you would prefer to eat at Folly Farm there is a Restaurant,a Licensed Pub and other eateries to choose from. 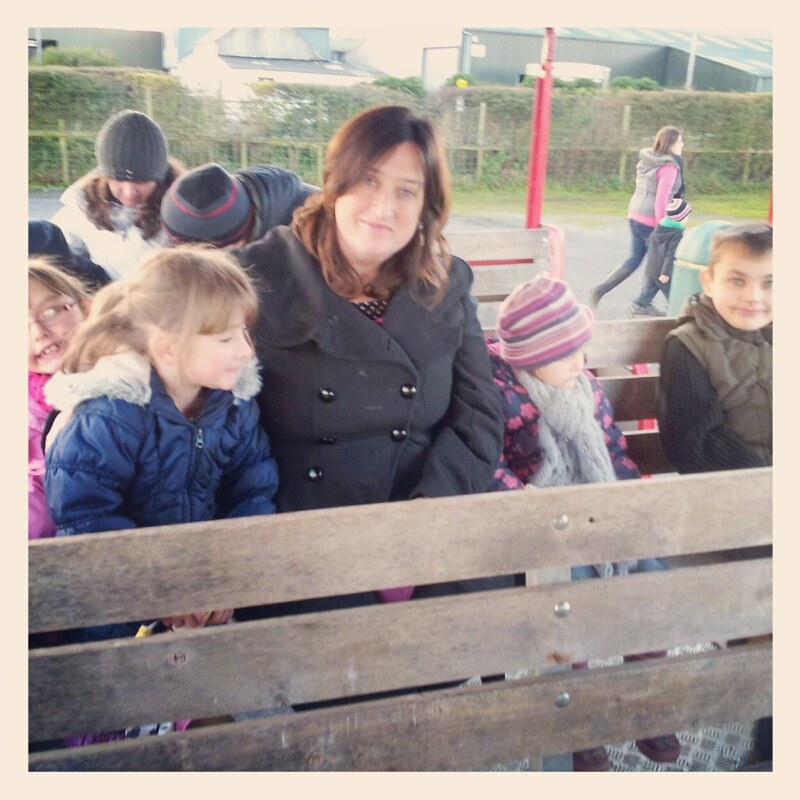 Folly Farm is the best day out for all weather fun. On this visit, we mainly explored the indoor areas but I can tell you about the outdoor areas too. There is a Zoo, with over fifty species of animals including Giraffes, Zebras and Fossa. Children are spoiled for choice with which outdoor play area to choose: The Pirates Advenure, Dragon Adventure and The Destruction Playground are our favourites to play in! 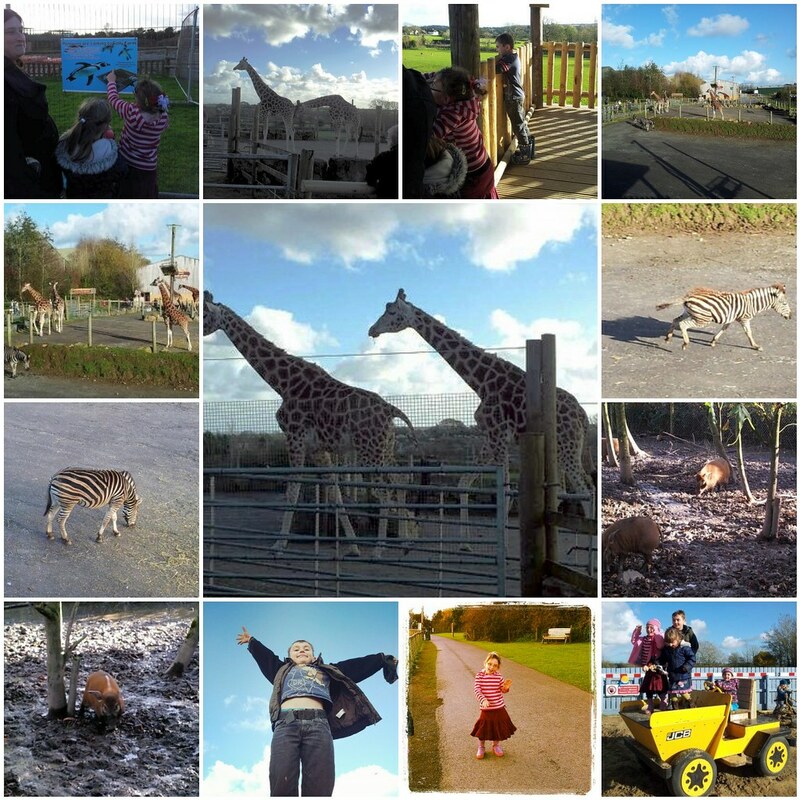 Overall, we had a lovely day at Folly Farm and can’t wait to return during 2013! Are you looking for a family day out? MoneySupermarket.com have a fantastic range of days out vouchers and deals to keep you and your family entertained for less. I need to choose some new places to visit now to look forward to in 2013! Next Post #TeamSkylanders Meet Danny’s new Life Character: CactEYE!